According to result of a poll about the things piss you off the most on FIFA 17, we get know that Input lag and delay has been one of the most. Actually since the game was released, many players have been experiencing the problems related to Lag and other issues in FIFA 17. FIFA 17 Input lag and button delay refers to a noticeable lag between a player pressing a button and the in-game character performing the action. Now, many people are at their last straw with the sluggish laggy unplayable online gameplay, especially in FUT Champions. So many FIFA fans plead for new patch to fix the issue, otherwise people will quit playing since no one can enjoy the game if it lags. 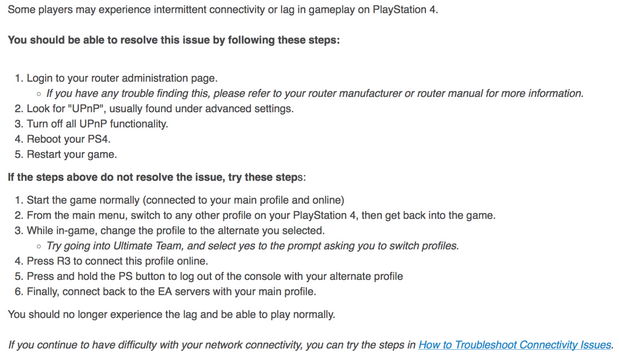 But we only get one response from EA Sports refers to some tips to fix lag on PS4 as below, many players still have not worked out the problem. How To Fix Fifa 17 Input Lag and Botton Delays? But when you play online with other players from around the world, your own internet connection is not the only factor to cause lag. A opponent who has bad internet connection or the distant between your guys can cause you to lag as well. When you have 36ms ping and your opponent has 250ms ping, if the server wants to sync up these two players, the only way is to add artificial latency to the player with the lower ping. Now wireless internet connection is very convenient, so many of you are using it to play games. But to be honest wired internet connection is more stable and faster. So if you are suffering the pain of FIFA 17 Lag, we suggest you can switch to a wired internet connection to see if the problem could be fixed. Using a VPN for gaming ensures that your connection to the game server is made through the shortest possible route and this helps you reduce FIFA 17 Lag down to a nonexistent level. When you are trying to fix Fifa 17 Lag, the first step is to check if your device meet the official system requirements of the game. If not, you upgrade your build to meet all requirements, better meet the recommend ones. Check out FIFA 17 PC Requirements here. The useful way to fix the lag problem is reset the graphics settings at lower levels, especially when your device doesn’t meet the requirements or just meet the minimum ones. And you can adjust it to the best spot according to your current hardware after trying some games. Make sure you have all of the latest possible optimizations for the game and your system hardware, update the game and your device system to the latest version on time, avoid the old versions cause the lags to your game. Here is mmocs.com which is one of the pro site of online game service site, we have Madden FUT 17 Coins for sale, if you want to buy FIFA 17 Coins with fast delivery service, come to us and we will never let you down. The conception of FIFA 17 FUT winter transfer isn’t complicated at all. Many players just read them quickly without a carefully notice of some details. There are two thing that haven been ignored by player in the game, first, a few small detail, second, how to invest the FIFA 17 winter transfer. Except for the exactly introduction of the two things, the requirements for the happening of a biggest transfer will be talked in this guide. In Ultimate Team, transfers are made through the release of new cards in two specific times: Summer and Winter Transfers Seasons. In order to keep the game updated, Electronic Arts replicates in to FIFA 17 Ultimate Team what is happening in the real transfer market. When a player moves from his club to another one in the real life, EA Sports releases a new card of this player: the transfer card. The only difference you will find between the new card and the old one, the regular version, is the club and eventually the league. In everything else they are physically identical, including the ratings and the stats which remain unchanged. When a player is transferred, the cards that start coming in packs are the ones with the new club. To each player who moves to other club during the FIFA 17 Winter transfers season, it is assigned a new regular card which becomes available in packs replacing the old one. In other words, as soon as the new card is inserted in FUT packs, the old ones can only be found in the existing clubs and in the transfer market. Your odds of pulling the new card from a pack are exactly the same of pulling the old one when it was available. If you own the original player card, your card will keep unchanged. If you want the new club version, you will need to buy the corresponding new card in the market or cross your fingers when opening a pack. When does the transfer take place in FIFA 17? As there are two transfer seasons in the real world: Winter Transfers Season and Summer Transfers Season, EA usually release transfer cards at same time to updating the game. So the winter transfer in FIFA 17 takes place within January / February. FIFA 17 Winter Transfers takes place before FIFA 17 Winter upgrades. These new cards’ prices vary mostly according to their new scenario. When the player goes to a popular club, his new card’s price will start rising to even reach three times the original value, and only after a few days it’ll eventually get close to the old card’s value. Many times these changes don’t even benefit chemistry for when the player remains in the same league. However, some players’ emotional will lead them into paying many coins for a card that’s actually not that different. You will find the new card’s price adjustment by noticing a player’s coming to a popular club. If he visits a popular club frequently, the new card’s price is lower than other cards. If he visits rarely, the card is higher. But it doesn’t mean the old card has been ignored by people forever, it still has the chance to stand out among numerous cards and becomes the most valuable ones. One of the best trading opportunities during the transfer windows has to do with players that stop coming from packs and so they become rarer and more expensive. If you buy this card in advance, you can later sell it for a much greater price when the market doesn’t have many to offer.